This is one of those rare items that has stood the test of time and has consistently been on TJ's shelves for years. 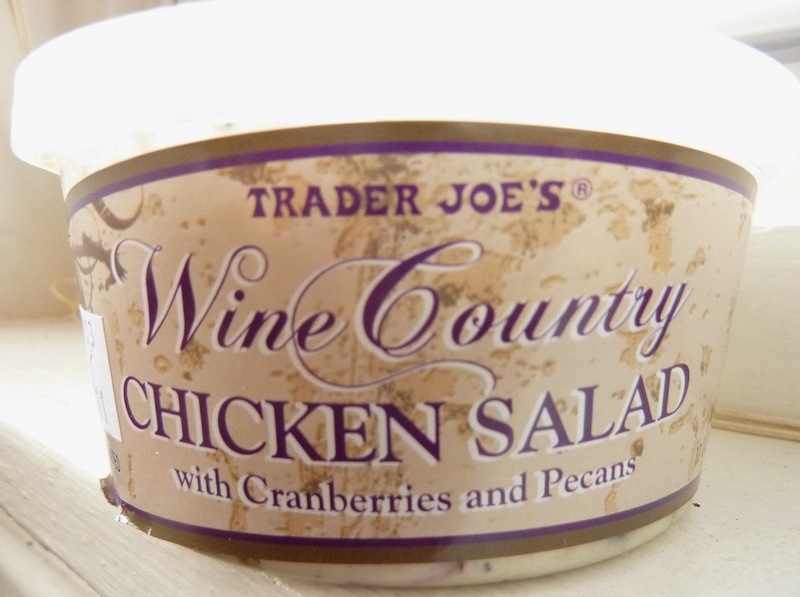 After recently reviewing the Curried Chicken Salad, I was reminded of the Wine Country Chicken Salad, which at the time, I had completely forgotten about. After the memory jog, I did recall having it years ago back in California. It's one of those items that we've actually eaten, but somehow a review slipped through the cracks. So for many of you, this might be an "oldie but goodie." If you've never tried it, though, it's worth checking out. 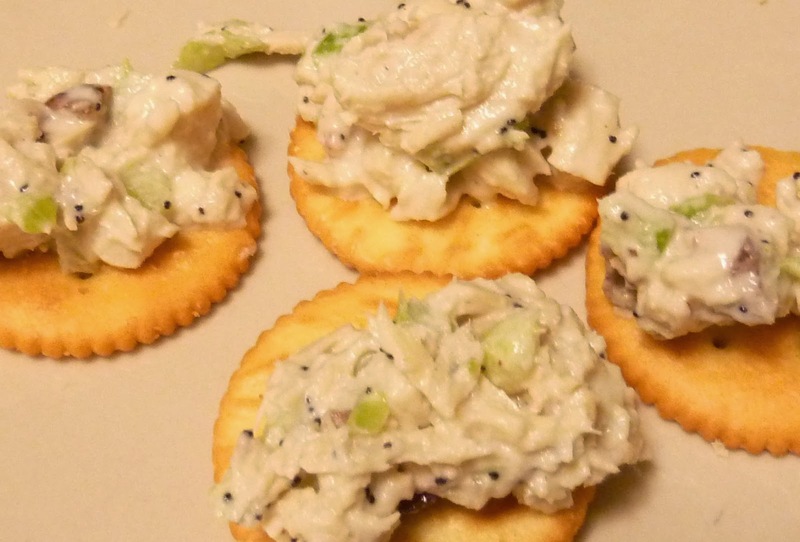 Similar to the Curried Chicken Salad, it has big chunks of white meat chicken. It also has celery, cranberries, and pecans. The white sauce is just enough to make it scrump-dilly without taking anything away from the natural flavors of the other ingredients. It's great with bread, crackers, and honestly, once you open the tub, it's really hard to stop eating it. Although I wouldn't put such a feat of gluttony past me, I did NOT eat the entire tub by myself in one sitting. I had a little help from Sonia. She's a huge fan of it, too. As the name suggests, it would pair beautifully with wine, probably a pinot grigio would go best. We wouldn't know, because our PA TJ's don't sell wine, and I didn't feel like making an extra stop after my last TJ's run, what with the sub-zero temperatures and all. Weirdly and unexpectedly though, there are vineyards just west of Philly, so there are plenty of local wineries we'll have to check out in the near future—that is if the vines survive this arctic vortex. Sonia and I are big fans. 4.5 stars from each of us. We couldn't score it quite as high as the curried version because we're both spice hounds, and we crave that extra tingle on the tongue. But for a tame, creamy chicken salad, it doesn't get much better than this. FYI, it's $4.49 at my TJ's. I eat this everyday for lunch... would hate to go many days without it. I make a big tossed salad and top it with 1/4 portion from the container. I add a few more TJ's candied pecans. I'd rate it a 10+. Chaddsford winery is a nice day trip in the summer. They have a picnic setting with live music on Sundays! Thanks for the tip, Mary! That's just a half hour or so from where we live. We'll have to check it out. Fill a pretzel roll with this - delicious! That does sound good, Tess! This rocks! Thanks for putting me on. Thanks for the info, Jacquy. Did you know Aldi actually owns Trader Joe's? Maybe it's the same product in different packaging...? Yummy for my tummy. Liked this! Would buy again. No wine at Trader Joe's??? That is criminal!! What is wrong with PA??? ?